If you need replacement crushing products for virtually any crushing situation, you can count on Samscreen. 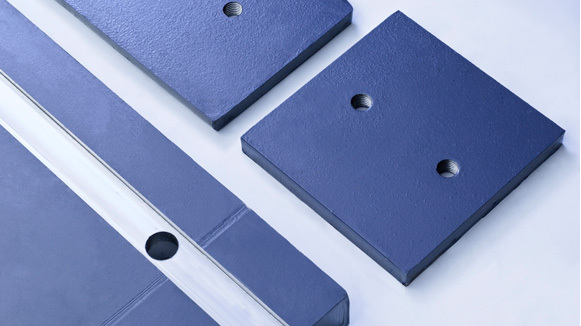 Our Ceramic Inserts are made for virtually all applications, and for popular crushing brands, including Pegson and Powerscreen 1412 and XH 500 Impactors. If you need Ceramic Inserts for your Pegson or Powerscreen 1412 or XH 500 Impactor, you can count on Samscreen to either have it in stock, or to manufacture it to your specifications. Our engineers are highly experienced in the aggregate field, so you can be sure that the Ceramic Inserts that you order from us will be of the best quality and a perfect fit for your Pegson or Powerscreen 1412 or XH 500 Impactor. Samscreen proudly manufactures replacement wear liners for all makes and models of crushing equipment, and can custom manufacture wear liners for crushing applications and machines. Our experienced customer service staff can help you make sure you get the proper wear liner and the proper fit. The aggregate industry is demanding on your wear liners, and our replacements can help you maintain optimal production levels and a quality finished product. What’s more, Samscreen strives to eliminate downtime and get your replacement wear liners to you as quickly as possible. That’s why we offer a comprehensive selection of wear liners – so they can easily be replaced and get you back to producing as soon as possible.